What this does: apt: URIs will open with Software Center instead of with apturl. This is part of the Software Center specifications. I have tested this change and it works. Benefits of this change: When installing software from an apt link, users will be able to see a screenshot, ratings and reviews (file size, version number, etc.) as opposed to only seeing a small installer window with the software description. Ubuntu Software Center is a much better looking and more useful interface than the simple apturl window. Caveat: This still won't affect apt: URIs typed into Firefox (LP: #634915) as ubufox calls apturl directly. This will however benefit apt: links in yelp. 2. An "Install additional software?" alert appears, asking "Do you want to install package 'abiword'?". 2. From <https://wiki.ubuntu.com/SoftwareCenter#apturl>: "Opening an apt: URL should launch the Ubuntu Software Center directly to the appropriate screen; or if it is already open, focus it, wait until any currently-open alerts or dialogs have been dismissed, and then switch to the appropriate screen." I recently had a problem which could have been solved if there was some way to 'link' to ubuntu software screens. I had to walk someone through searching on the Ubuntu Software Centre (https://lists.ubuntu.com/archives/ubuntu-ie/2010-August/000749.html). If I could have said "Click this link xxxxxxxxxx." then it would have been much easier to help this person. It would be very nice if apturl could open the Software Center instead of the little installer it does now. The little installer does not have a screenshot or reviews or any of the other details (file size, version number, etc.). Since this is different from the specification and results in the user being quite a bit more blind as to what the installation will do, I think this should be a higher priority than just Wishlist. This bug is marked as wishlist but the good news is a fix was released on 12 August 2010, as per the update from Kiwinote above. I just tested this in the latest version (in Natty) by typing 'apt:abiword' in the Firefox address bar and Software Centre opened with AbiWord read to install. I believe you will need Software Centre from Maverick or Natty to experience this fix though - are you running an earlier version of Ubuntu? Aaron, I just tested on a Natty live CD and apt:abiword opens in a small installer window, not in Software Center like it should. The bug is not that software cannot be installed with apt: shortcuts but that it doesn't happen in Software Center. If apturl is uninstalled, apturl apt:abiword still works from the command line (but not in Firefox) and opens in Software Center so it is correct that SC has this feature working but apturl does not. Hi! In natty apturls are dealt with slightly differently to maverick. I *think* what remains to happen here is to set s-c as the default apturl handler by appending "x-scheme-handler/apt=ubuntu-software-center.desktop" to the defaults.list in the desktop-file-utils package. I have proposed a branch that fixes this bug. Thanks Kiwinote for the tip! This works fine from within yelp in natty (apt urls open the Software Center, presenting the user with information about the appropriate application), but within firefox, the apt:[app name] feature doesn't seem to work correctly. 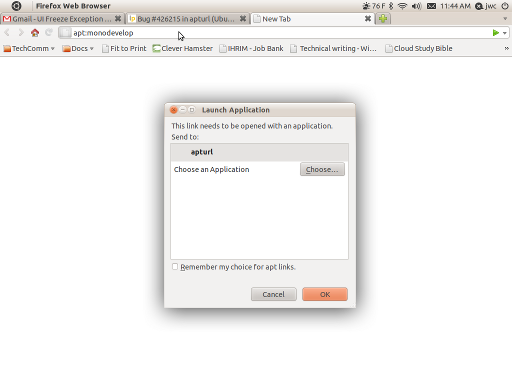 Per the attached screenshot, it just opens up a window asking which application should open the URI. If I select "Choose," it gives me a file-selector window. This assumes that I'll know where to go to have this open in the Software Center. Image of an apt-url from Firefox. Jim, I don't know why the apt: urls works for you because they do not from a Natty live CD. And this is important because we're writing the Ubuntu Help to assume that Software Center will open apt: links. Firefox integration is a separate issue (LP: #634915). I'm still looking for someone to sponsor this as it would make the Ubuntu documentation better. > Documentation Project Team, which is a direct subscriber. apturl. This is part of the Software Center specifications. > I have tested this change and it works. > apt: links in yelp. Uploaded the desktop-file-utils change now to natty. Will this change affect systems that do not have Software Center installed? Scott, what systems do you mean? ubuntu-desktop & xubuntu-desktop depend on desktop-file-utils and software-center. kubuntu-desktop does not. I've contacted the Lubuntu community as this may affect them. Any third-party derivatives ought to pay attention to the desktop-file-utils package for changes to defaults like this one. Would you like me to contact the xubuntu team??? > on desktop-file-utils and software-center. kubuntu-desktop does not. > I've contacted the Lubuntu community as this may affect them. > utils package for changes to defaults like this one. Piggy, thanks for the offer. Since Xubuntu ships both software-center and desktop-file-utils, I don't think any action is needed on Xubuntu's part. Nothing left to do. Unsubscribing ubuntu-sponsors.